Too busy to stay organized? Think again. You need these five incredible ways to start organizing your home when you are too busy. “I wish I could get organized, but I just don’t have enough time!” Yup, it’s a common excuse. And you know what? It’s a good one! But there is one problem with it – organizing your home will actually save you time in the long run! We all want to have a beautiful home that is so organized we could be featured in a Better Homes and Gardens magazine. 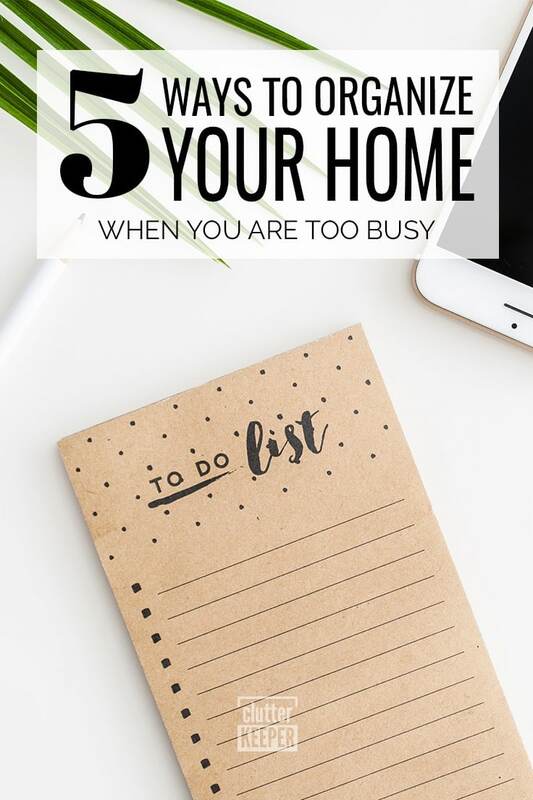 When life gets busy, and we’re struggling to keep the house in a somewhat manageable state, organizing falls to the bottom of the to-do list. No matter what shape your home is currently in here are five incredible ways to start organizing your home when you are too busy. The first step is to have a visual to-do list. So the next time you open your closet only to realize that you can’t get to your favorite pair of shoes, write it down on your to-do list! You won’t always have a lot of time to organize, but when you do, it’s important to focus on those spaces that need the extra time and effort. Start an organization to-do list, and even order it by priority if you want to. List Apps – There are a lot of fantastic list apps that will send you notifications, reminders, and even fun actions when you check off items. This is a pretty complete list of the best to-do list apps. Command Center – Add a to-do list to your command center. Don’t have a command center? Try one of these! Planner or Calendar – Just add “home organization” to your planner. Pro tip – use colored pens or stickers to make your list stand out. Next, go through your stuff very quickly. If you are struggling to organize your home, the problem may lie in your sorting or the fact that you are holding onto items you no longer use. In your free time, go room by room and sort through your belongings. Remove the things you are no longer using, and donate them to a better home. Keep a bin close to the door where you can put these items as you find them. When you replace an item, you already own, put the old one into the bin. When it comes to organizing your home, trying to tackle the whole house at once might be a little too much. Instead, focus on just one room at a time. Start with your most challenging room to organize and gradually work your way up to the easier rooms. If you need to break it down even further, focus on one area at a time until you’ve thoroughly worked through the entire room. A key way to find out what the best way to organize your home will be is to think about how you use your space. Are you a grab and go kind of person? Do you naturally put things back where they go? Are there areas of your home that get more usage than others? Asking yourselves these questions can help you figure out whether or not an organization system you’ve chosen will work well for your space. We can be in such a hurry to quickly organize a space as soon as possible, but the reality is that some spaces may take you weeks or even a few days. It’s okay to take your time and slowly work your way through the home. Don’t feel like you have to finish a new space every day, and focus on the areas where you need help the most first. 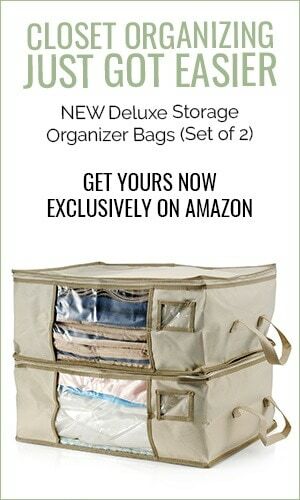 You don’t have to have a bunch of free time to have a well organized home! If you follow these five tips, your home will finally get organized. If these 5 tips helped you get your home organized, you will love these next ones too. 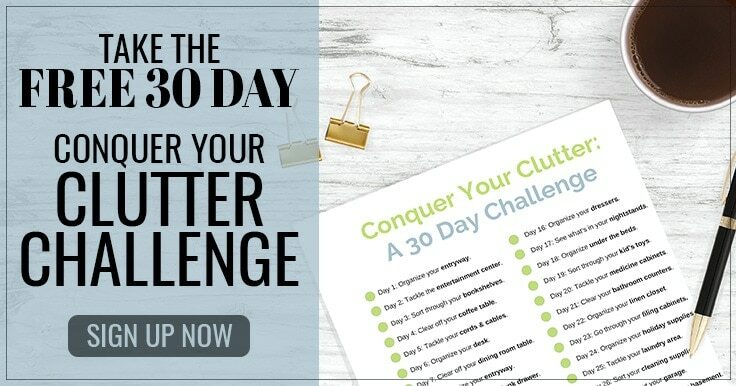 30 Day Conquer Your Clutter Challenge – It’s so easy! 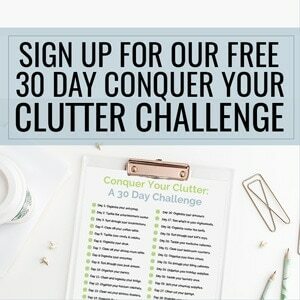 You’ll have an organized home in a month. Living Room Organization – This is a complete and thorough guide to organizing your living room. 5 Things to Do With Unwanted Clothes – As you declutter, here are some ideas for all your clothes you’ll be giving away.